Immediately after the end of World War II Wilson Sporting Goods, his longtime sponsor, pressed Snead to travel to Great Britain to promote their clubs and balls as golf became reestablished following six years of war. Snead had played in the Open once before, in 1937, and was not especially enthusiastic about returning but perhaps the fact the venue was the Old Course at St. Andrews helped make up his mind to go. Slammin’ Sammy apologized profusely but failed to mollify his fellow passenger who turned out to be a titled member of royalty. Snead couldn’t remember for sure but it was “Duke Something” and the Duke was not bashful telling newsmen on the scene the entire disgraceful—in his eyes—story. The British newspapers took Snead to the cleaners which was not something done with the same intensity in the United States at the time so the “Hillbilly Pro” had a tough time the entire week. 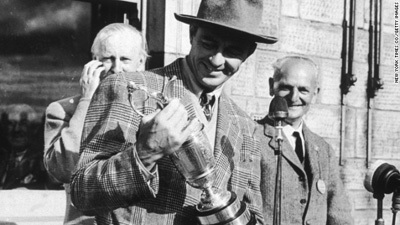 But Snead was able to get his revenge for the unfriendly treatment by fans and the press…he won the 1946 Open Championship by four shots and even though he got the first place check, a paltry $600, he did not go back to defend in 1947.